If you’re at all connected to the journey of addiction and recovery, Beautiful Boy (dir. Felix Van Groeningen) will be significant. It tells the true story of a David and Nic Sheff, a father-son duo played charismatically by Steve Carell and Timothée Chalamet respectively, who work to try to help the son on his journey towards recovery from drug addiction. In the words of Carly Taylor, it is 30% Oscar pandering, and 70% educational and/or for the community. That latter part was especially made clear with the blurbs at the end about addiction stats. Overall, it’s a picturesque depiction of drug addiction and its immediate impacts on one’s family and livelihood. “Picturesque” actually doesn’t begin to capture just how distractingly pretty this film is. The story is a tough one, and an important one, to watch - and it is also deeply undercut by so much… wealthy whiteness. I don’t know how else to describe it except to quote Brittany Luse in NPR’s Pop Culture Happy Hour when she says she “feels compassion, but no sympathy” for the characters. I, unfortunately, did spend a majority of the film wondering how I would love to live in their beautiful, sunbathed wooden home. Chalament’s character, Nic, goes through the cyclical journey of recovery, in and out of very beautiful rehab centers, while Carell’s character spends nearly the same amount of time booking and cancelling flights to fetch his son. 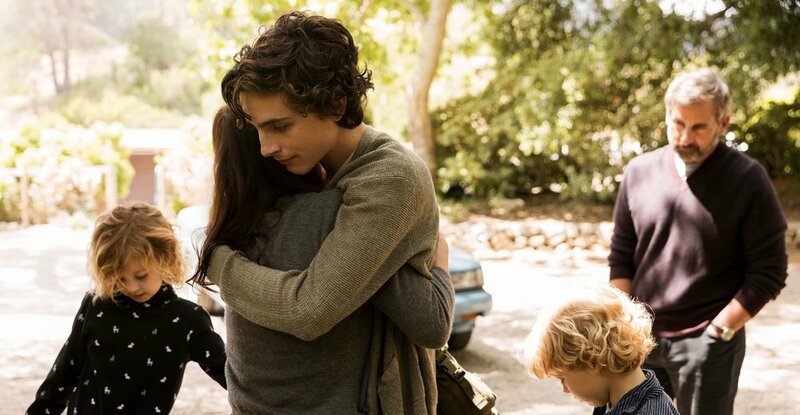 Beautiful Boy doesn’t fail to show how expensive drug addiction can be to a family, in the immediate price of drugs and rehab and whatnot, but also in the emotional taxes on family togetherness. Steve Carell has absolutely proved he’s got the chops to be an impressive dramatic actor, and I’m excited to see Welcome to Marwen. It was also fun to see him acting opposite Amy Ryan again, who played his love interest on The Office. Timothée Chalamet… maybe it’s because I really disliked him in Lady Bird or am just tired of seeing him everywhere, but while he also delivered a very nuanced performance, I just can’t bring myself to like him. I simply couldn’t shake the idea that I knew it was Timothée Chalamet acting as a character. However, despite impressive performances from both the lead actors, Beautiful Boy doesn’t rely nearly as much as it ought to on its cast to carry the story; instead, what could’ve been a more tender story turned into a very Oscars-y indie-y movie, with too much, unnecessary editing and too loud, unnecessary music cues. Reminiscent of Blue Valentine, the film attempts to tell the story in a back and forth fashion, jumping from present day to Nic’s childhood, from near-past day to Nic’s teenage and college days. It doesn’t work nearly as well as Blue Valentine did. But what is important about this film, and what it attempts to do, is that it’s based on the two memoirs by the real David and Nic Sheff. The story is authentic to their experiences, and you can see that in the writing. From moments that feel unnecessary in a more generic addiction story, like David trying drugs himself to help/relate to Nic and plucking a random girl off the street to tell him about drugs, to more tender scenes between Nic and his family, Beautiful Boy made sure to include the seemingly mundane, and not cinematic, aspects of trying to help recovery. And for an addict like Nic, recovery is a constant 24-hour cycle, taken one day at a time, and which could at any second, with death being an extremely realistic outcome. The storytelling made sure to reflect that journey. For those with not much exposure to things like addiction and recovery, Beautiful Boy is an interesting, potentially informative, and pretty film. But it’s gotta be known that for the vast majority of people who are going through addiction and recovery, this film is not the complete reality. I suppose it’s because of this reason, among others, that I dub this film as this year’s Lady Bird (but obviously with some notable differences).